Unlike traditional metal braces, Invisalign® is a nearly invisible method of straightening your teeth. Each patient will receive a unique series of custom fabricated, removable, clear aligners that work by gradually moving teeth into their preferred position until the smile you desire has been achieved. 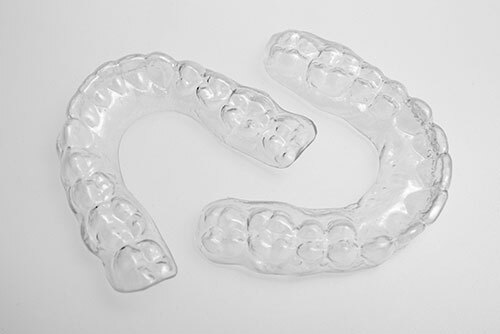 MTM® Clear•Aligner uses clear, removable aligners to correct slight misalignments (such as crowding or gaps). Each aligner is custom fabricated, per your doctor’s treatment plan, to progressively advance your teeth into their ideal position, leaving you with a healthy and beautiful smile. To learn more, visit the MTM® Clear•Aligner website. 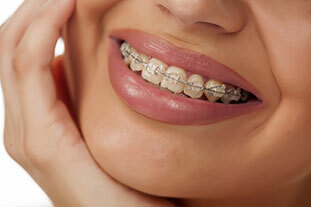 Metal braces are what first comes to mind when someone starts thinking about orthodontic treatment. 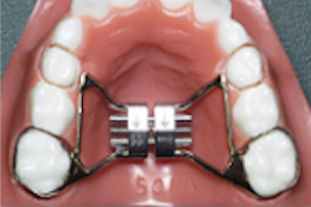 With the advancement of technology, however, todays metal brackets are smaller, lighter and more efficient than ever! Made of high-grade stainless steel, these brackets are the stronghold of our profession. 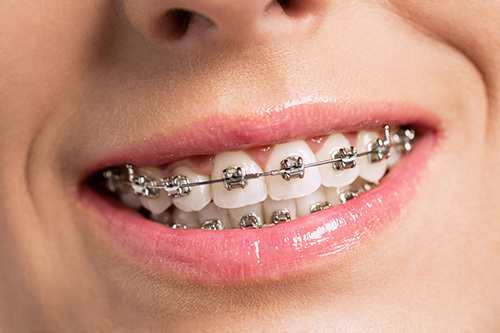 Made from tooth-colored material, ceramic braces are the same shape and size as their metal counterparts. Their “clear” or “translucent” appearance, however, makes them an attractive alternative for those patients wanting a more discreet look. 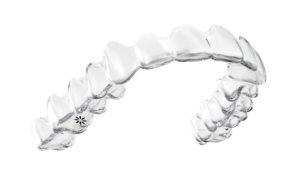 Self-ligating brackets can be made from either metal (In-Ovation R) or ceramic (In-Ovation C) just like traditional brackets. 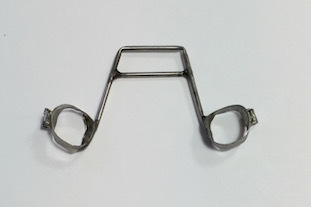 However, this type of bracket uses a specialized gate, or clip, to hold the arch wire in place and therefore does not require the use ligature ties. This feature allows for less friction, easier tooth movement, and faster adjustments. 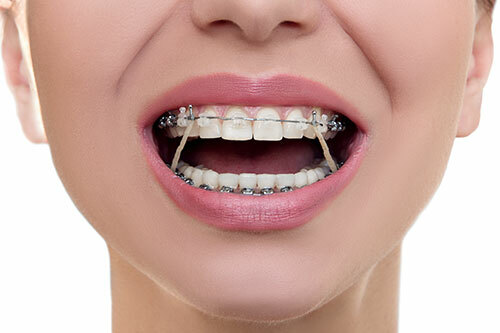 Elastics, or “rubber bands,” as they’re commonly called, are used in orthodontics to provide the correct direction and degree of force necessary for proper alignment of the upper teeth with the lower teeth. 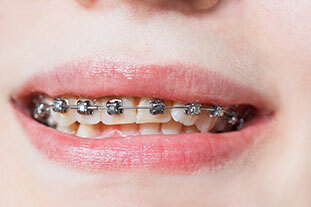 Not everyone who has braces will need elastics. 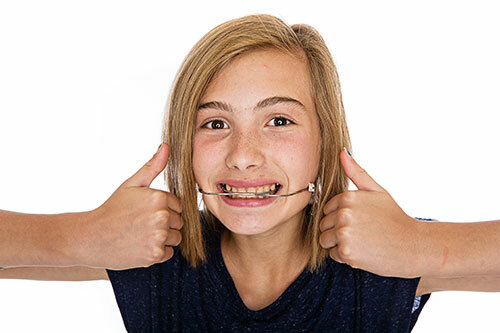 The orthodontist will help decide if elastics can help improve your smile! Headgear is an external appliance that helps to guide jaw growth in a favorable direction. As dentofacial orthopedic specialists, the orthodontist is uniquely qualified to handle the growth of specific facial structures in growing children. Headgear is typically worn whenever the child is at home and during the overnight hours. Don’t worry, we will never ask you to wear your headgear to school! The E-Arch is a pre-activated appliance used for mild expansion of the upper and/or lower jaw during the mixed dentition stage of development. Once cemented, the E-Arch will encourage approximately 3-4mm of expansion over a period of several months. This is a very simple and gentle process which younger children handle extremely well. The Hyrax Expander is an appliance designed to widen the upper jaw by placing midline pressure on developing palatal sutures. 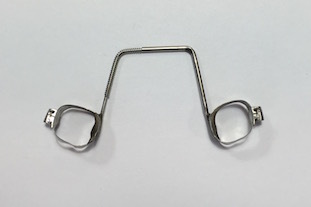 Used to create space and correct crossbites, this expander is easy to adjust and keep clean. A habit breakers is a cemented appliance that helps break or stop a dysfunctional habit, such as thumb sucking. The tongue crib (pictured right) is a specific type of habit breaker that prevents your thumb from resting comfortably on the roof of your mouth. Essentially, this makes thumb sucking a less pleasurable experience and the habit tends to vanish within a few weeks. To ensure success we prefer to keep the appliance in place for approximately six months. During this time it is not unusual to observe a positive and spontaneous change in the patient’s smile! 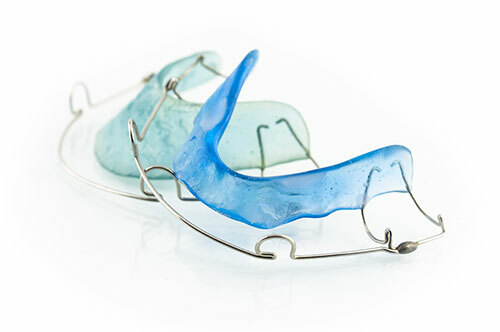 Protect your orthodontic investment and wear a mouth guard during and after treatment! 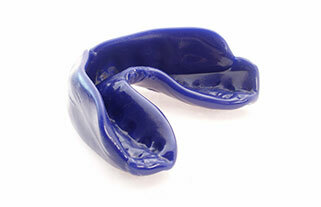 Wearing a mouth guard greatly reduces the risk of damage to your teeth and jaw bones. All mouth guards should be comfortable, well-fitted, and easy to clean. A custom athletic mouth guard is fabricated specifically for you using a full-mouth impression and it provides the highest level of protection and comfort without interfering with speech or breathing. Talk to a team member today and safeguard your beautiful smile. Custom fit once braces are removed, Hawley Retainers help prevent straightened teeth from moving back to their original position. 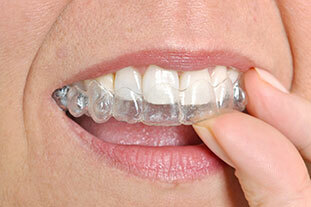 This type of retainer is made using acrylic and wire. Hawley’s are durable, adjustable, and can be customized using different colors and designs. An alternative to the Hawley retainer, an Essix retainer is made by having thin, transparent plastic vacuum-formed to fit your teeth after the braces come off. Many patients consider this appliance to be more aesthetic because there are no wires. Regardless of the design, always remember that retainer wear after orthodontic treatment is essential to maintaining your new smile!